A resident of the Chauhan Pyau area, Raja told The Indian Express that Pragatisheel Samajwadi Party chief Shivpal Yadav has “approached him” and offered the Gwalior Lok Sabha ticket. On April 2, 2018, Dalits had called a Bharat Bandh to protest the alleged dilution of the SC, ST (Atrocities) Act which turned violent in Madhya Pradesh, Uttar Pradesh, Rajasthan and Punjab. One year ago, Deepak Jatav, 22, bled to death in front of his father’s tea stall cart. He was part of a group of onlookers standing outside the shop when an upper caste mob came charging at them. Moments later, one bullet pierced his left arm and another hit the left side of his chest. He collapsed on the spot. On Tuesday, that tea stall cart lay abandoned in the Gallar Kotha area of Gwalior as people avoid it since it is the “shop of a Dalit”. And with the wounds and fear from last year’s violence still fresh, Deepak’s family has also applied for five gun licences and several residents in the locality want firearms saying “self-defence” is the only option. Across the road from the shut shop, Raja Singh Chauhan, one of the four accused of killing Deepak, is preparing to contest the Lok Sabha polls and polishing his oratory skills after being “approached” by a senior Uttar Pradesh politician. 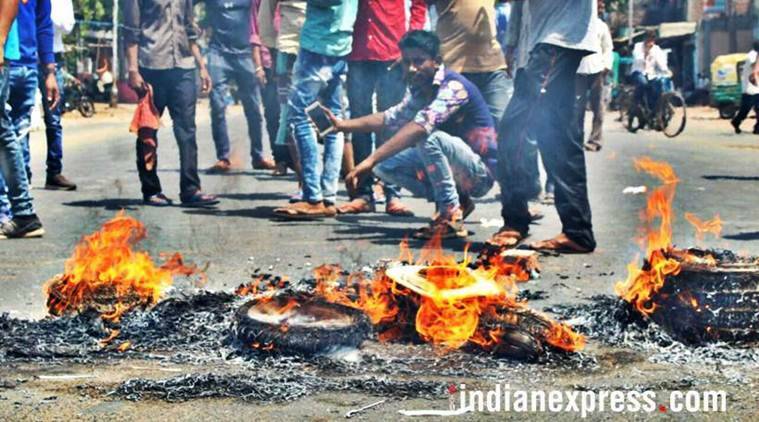 On April 2, 2018, Dalits had called a Bharat Bandh to protest the alleged dilution of the SC, ST (Atrocities) Act which turned violent in Madhya Pradesh, Uttar Pradesh, Rajasthan and Punjab. Of the nine dead, six were killed in MP, two in Uttar Pradesh and one in Rajasthan. Officials said seven of the nine killed were Dalits. And in Madhya Pradesh’s Gwalior, the epicentre of clashes between upper caste groups and Dalits, the blunt irony could not have been starker. “The influential Thakurs issued a diktat after the incident to not drink tea at my shop. Log aana bandh kar diye, bandh karna hi pada (gradually customers moved away, I had no option but to shut it,” said Deepak’s father Mohan Jatav, 56. As a mark of respect, a framed portrait of Deepak was kept behind a flickering candle under a Sesame tree in the locality on Tuesday as the family and neighbours huddled around as visitors dropped by, offering homage and discussing politics. The violence of that day on April 2, 2018, still haunts them but it is now mingled with talk of the Lok Sabha polls on May 12. Contrast this with Raja, a member of an influential Thakur family in the neighbourhood which runs a slew of businesses and owns multiple shops. Raja was seen firing shots from a revolver in several clips that went surfaced on social media after the violence. “Shivpal Yadav has approached me to contest polls from Gwalior and I will contest. Raja Bhaiya from Pratapgarh is also in the know. My father has been with the BJP since its Jan Sangh days,” said Raja. Town Inspector Yeshwant Goyal said the chargesheeted was filed eight months ago on charges of murder and that the trial is on. All the accused are out on bail. Meanwhile, the Gwalior police, taking no chances on the first anniversary of the violence, deployed extra security forces including paramilitary personnel to patrol the streets. A few blocks away from Thatipur, at Bhimnagar, another family is in mourning. Rakesh Tamotiya (45) had succumbed to bullet injuries during the clashes while walking back home after a few futile hours of waiting for work at the local labour chowk. Following his son’s death, Netram Tamotiya (72), who worked as a mason, has been running pillar to post to get his old age pension sanctioned, but to little avail. “I have three sons now, who are all labourers. Pradeep left behind his wife and three children. The elder daughter got married in February. No one in our family has ever been a government employee,” said Netram. According to Raja, he did use firearms. “They attacked us because they thought they targeting an influential family will create a fear psychosis. We are kshatriyas, and when we are attacked we will have to respond. We used licensed weapons but did not kill anyone,” he said. Gwalior District Magistrate Anurag Chaudhari said the administration has disbursed Rs 8.5 lakh to both the families and will expeditiously process their applications for arms licenses and government jobs after the Model Code of Conduct is lifted. An administration official said that Bhind district, which borders Gwalior, alone has 22,000 licensed-gun holders. “During assembly elections, over one lakh licensed guns were deposited from Morena, Bhind and Gwalior,” said the official.